Tyrone have made one change for Saturday's All-Ireland SFC round 4B qualifier against Sligo with Rory Brennan replacing Cathal McCarron. Brennan, one of three members of the All-Ireland winning U21 team in the starting 15, takes over from Dromore man McCarron at corner-back. Conor Meyler, who made his senior debut in the win over Tipperary, retains his place in the half forward line. Despite their Connacht Final hammering by Mayo, Sligo are unchanged. Mayo crushed the Yeats County 6-25 to 2-11 in the Connacht decider but Sligo manager Niall Carew has offered the same players the opportunity to atone for that dismal display. Carew is hoping that his players can regain the kind of form which helped them surprise a highly-fancied Roscommon outfit in the Connacht semi-final. In the Connacht decider, Sligo were unable to recover from a horrible start as Mayo led 2-2 to 0-0 after only six minutes. Tyrone's last meeting with Sligo, also a Croke Park qualifier back in 2002, ended in a shock victory for the Yeatsmen, and paved the way for the appointment of Harte, who guided the Red Hands to the first of three All-Ireland titles a year later. This time, the Ulster men are hot favourites to set up an All-Ireland quarter-final meeting with either Monaghan or Mayo. 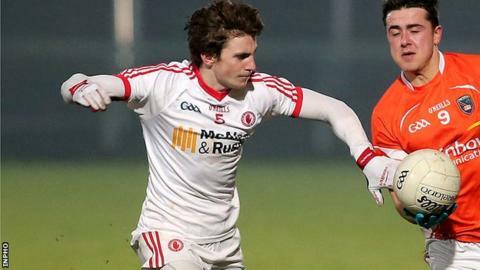 Justin McMahon and keeper Mickey O'Neill return to the Tyrone subs bench. O'Neill had minor surgery on a knee injury while McMahon missed the last two games because of a calf problem. Peter Harte has been named at wing back, but is likely to operate as an offensive midfielder, a role in which he has been extremely effective in recent weeks. Sligo: A Devaney; R Donavan, K McDonnell, D Maye; K Cawley, B Egan, E Flanagan; C Breheny, N Murphy; B Curran, M Breheny, N Ewing; D Kelly, P Hughes, A Marren. Tyrone: N Morgan, A McCrory, R McNamee, R Brennan, R McNabb, Joe McMahon, P Harte, C Cavanagh, M Donnelly, T McCann, M Bradley, C Meyler, D McCurry, S Cavanagh, C McAliskey.